These are the words of RoseLee Goldberg, a leading New York-based curator of performance art, who was once involved with The Kitchen, an alternative space for experimental artworks set up in 1971 in Greenwich Village. She also launched Performa 05, a biennial of performance art, in 2005. Performance art refers to the actions of an artist and is usually live but can also be documented through video, film or photography. Once an artistic field on the fringes, it is now mainstream. It is the impermanence of performance art that appealed to avant-garde artistic movements throughout the 20th century. It was initially explored by Dadaists who employed aspects of cabaret and vaudeville to challenge the rationalism practised and promoted by Cubist artists. Composer John Cage and dancer Merce Cunningham, who were working at North Carolina’s Black Mountain College after World War II, were one of the early proponents of performance art. They influenced such acclaimed practitioners as American painter and graphic artist Robert Rauschenberg and Japanese multimedia artist Yoko Ono. In Europe, art corporel, or body art, emerged in the 1960s. Starting in Vienna, it soon spread to France, Italy and other parts of the continent. Fluxus, an art community which brought German artist Joseph Beuys into its orbit, too, came about around the same time. “Happening”– a name initially given to performances at the farm of American painter and sculptor George Segal in 1957 – also attracted many artists. These performances were influenced by the Dadaist declaration that artists do not need to come up to the audience’s expectations regarding what their art looks like. Interest in performance surged in the late 1960s and the early 1970s as artists sought to dematerialise art objects, moving away from Modernist art’s focus on the concrete and the contemporary and engaging in what came to be known as conceptual and process art. Many of them explored works that focused on the human body. Some of their works are now iconic. In Shoot, a 1971 video, American artist Chris Burden had an assistant in a gallery shoot him with a rifle. In a 1974 performance, Trans-fixed, he was crucified to the back of a Volkswagen Beetle. In I Like America and America Likes Me, also performed in 1974, Joseph Beuys lived for three days inside René Block Gallery in New York with a wild coyote. The popularity of performance art waned in the 1980s as a booming art market favoured objects that could be sold and resold. It re-emerged in the politically volatile 1990s among artists who wished to address issues such as race, immigration and the AIDS crisis. Museums have since presented major exhibitions of performance art, including Serbian performance artist Marina Abramovic’s Seven Easy Pieces presented at Guggenheim in New York in 2005. In Pakistan, performance art has begun to gain traction only over the past decade. This is not to say that performance art was not attempted before here. In the 1970s, when performance art came to prominence in the United States and Europe, some Pakistani artists did engage with it in some form or the other. One of the earliest performance works was Salima Hashmi’s Hunda Hubalna (how to boil an egg) from 1970. It originally appeared as a skit in the popular comedy programme Such Gup on state-run Pakistan Television (PTV). In it, the artist, speaking in the English-accented Urdu of a high society housewife, sets out to explain how to boil an egg and then does everything but. In recent years, Hashmi has revisited the spoof as a performance in art spaces all over the world as a testimony to her subversive actions in politically troubled times. In 1974, Rasheed Araeen performed Chakras in Jheel Park in Karachi at the behest of gallerist and painter Ali Imam. This was the recreation of a work that he had originally enacted in London in 1970. Inspired by the flotsam he saw in waters that surrounded his London studio, Araeen created 16 circular discs, each 24 inches in diameter, and painted them red. He then tossed them into the water with help from his colleagues and documented their movement with a camera every day over the next two weeks. In another approach to performance, Sheema Kermani launched Tehrik-e-Niswan, an activist theatre group, in the late 1970s. Drawing upon the Subcontinent’s traditional styles of storytelling that involve dance, music and dialogue, her troupe performed short plays that addressed issues concerning the rights of women and marginalised minorities. Action painter Ismail Gulgee and a visiting Belgian artist collaborated in 1980 to create an artwork that could be seen as a hybrid between public art and performance. They painted two large abstract canvases side by side in front of an audience at the Karachi Arts Council. A few more performance works were done in later years. One of them was Uzma Durrani’s 1996 work Ignitable Souls which unfolded over 50 minutes at the Pakistan National Council of the Arts in Islamabad. In it, the artist, dressed in red, lit a fire and then covered herself in its ash. Abacus, a 2005 work by Amin Gulgee included in an exhibition of his sculpture at Canvas Gallery, Karachi, featured artist Seema Nusrat. In moppet-like make-up and a wig, she systematically smashed, for three long hours, doll heads threaded onto a horizontal abacus beneath a sign that read “calculate”. In 2009, David Alesworth and Adnan Madani presented their performance piece, People’s Art Historical Garden Centre, at Grey Noise Gallery, Lahore. It showed a man tearing pages from the art historian Akbar Naqvi’s book Image and Identity: Fifty Years of Painting and Sculpture in Pakistan, a contentious survey of Pakistani art first published in 1998. The man folded and glued the torn pages into tiny envelopes, placed seeds in them and handed them out to the audience. This, apparently, was Alesworth’s response to being described as more of a horticulturist than an artist in the book. In 2012, Sarah Ahmed Mumtaz performed Everything Will Be OK at the National College of Arts in Lahore. She sat in front of a mirror putting on make-up and then removing it. She then stitched her stockings with gold thread, as if she was repairing her legs damaged by cerebral palsy in her childhood. Repeatedly shrieking “everything will be okay” in Urdu, she tried on and flung aside several pairs of shoes before settling upon a gold one. Over the past decade, many other works have been performed as part of gallery shows and art residencies. One notable example is Roohi Ahmed’s 2018 video Out of Bounds (thirty one minutes and 57 seconds long) which was shown at Karachi’s AAN Gandhara-Art Space as part of her solo exhibition The Distance Between Two Points. In it, the artist meticulously sewed her own hand with blood-red thread drawing no blood. Performance is now increasingly becoming an integral part of the Pakistani art scene. This has led to an interesting phenomenon: The emergence of curated group performance shows. The first example was Riwhyti: One Night Stand, curated by Amin Gulgee at his gallery in Karachi in 2013. As a non-commercial, artist-led space, the gallery was a suitable venue for a comprehensive display of performance art. Amin Gulgee, indeed, has engaged with performance art since 2000, first in runway-based shows that paired his jewellery and sculptures with the movements of fashion models and then in works that involved his personal narratives. For Riwhyti: One Night Stand, which was a collateral event of the 4th ASNA Clay Triennale, he invited 26 artists to simultaneously perform around 20 works over a period of two hours. The artists he engaged were an eclectic bunch – painters, sculptors, photographers, art students, actors, fashion designers and musicians – reflecting his longstanding interest in multidisciplinary artistic endeavours. The approaches to performance in the show were as varied as the performers themselves. In one work, Salman Hassan and SM Raza, both dressed in black shalwar kameez, faced one another over a white sheet upon which were placed terra cotta vessels containing water, sand and red pigment. They began the performance by bathing their feet with water. After performing a series of self-designed rituals, they lay motionless on the sheet with terra cotta vessels in shards and water dyed in red spilled all around them. This was meant to be a commentary on the violence that has convulsed Pakistan in recent years. Fashion designer Fayez Agariah performed Paraphernalia in which he sat in an open suitcase filled with pieces of coloured cloth which he frenetically sewed into a cocoon around himself. “Stitch me up/Tie me down/Into my skin/Without a sound,” he wrote on a printed map of the exhibition that carried the photos of featured artists and their statements. Syed Ammad Tahir’s work, Mirror, Mirror on the Wall, allowed the audience to peer into the privacy of his bedroom. Viewers took turns sitting on benches to watch him dance in front of a mirror while also adorning himself with make-up, a wig, jewellery and pump shoes. Danish Raza’s Sacrifice and Surrogates was a commentary on the ever-controversial electoral process in Pakistan. 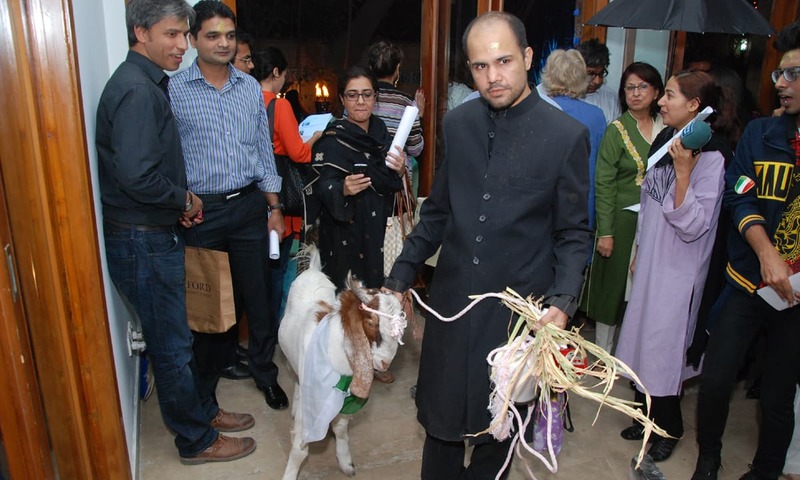 Carrying a cardboard box, he led a goat, a Pakistani flag tied around its neck, through the bustling gallery, handing onlookers a piece of paper that posed a single question: Should we sacrifice the goat or not? The audience was asked to mark the paper with their answer and then cast their “vote” by dropping it in the cardboard box. Muzzumil Ruheel and a group of fellow artists, dressed identically in black with kohl applied to their eyes, carried open umbrellas that shaded the members of audience as part of a performance piece titled Black Umbrella. It was an obvious commentary on the state of surveillance in contemporary Pakistan. The crowd, which numbered in the hundreds by the end of the evening, was at once perturbed, amused, baffled and intrigued. Riwhyti: One Night Stand was followed by Dreamscape which Amin Gulgee co-curated along with Zarmeene Shah at Amin Gulgee Gallery in December 2014. This exhibition included 48 artists and featured not just performance art but installations as well. As in the earlier exhibition, performances in Dreamscape were executed simultaneously on the opening night though the installations remained in place for another three days. As part of Dreamscape, Sunil Shanker and Kashif Hussain, both actors from the National Academy of Performing Arts (NAPA), covered their mouths with tape and climbed ropes suspended from the gallery’s ceiling — symbolising an apparently Sisyphean struggle against censorship. Muhammad Ali and Manizhe Ali expressed empathy in their work with the victims of sectarian violence. They sat as likenesses of Mona Lisa in voluminous black skirts in front of a wall knitted with 1,300 red roses by Muhammad Ali over a whole year. The work addressed the duality of human nature, the masculine and the feminine, and the in-between state of being out of sync with a majority. In another work, Omer Wasim stood with his face thrust in a pillow pressed against a pillar in the gallery for a period of three hours. On either side of him were casts of his legs in concrete, cut off at the knee. The performance was accompanied by two installations by the same artist. One of them showed a personal statement by him stencilled in chalk in several places on the floor of the gallery. These fraught, private declarations were destroyed by the shuffling feet of curious viewers — as was the artist’s intention. Unwittingly, the crowd completed the work through this “performative” act. Shalalae Jamil’s Things that Happen in Bed # 1 was another work that encouraged participation by the audience. In it, the artist lay on a mattress on a landing of the gallery. Positioned next to her was an A4-size piece of paper that said: “You are invited to watch a six-minute film with the artist in a bed. Please limit your exchange to a greeting and a good-bye.” The film, shot in Chicago, was based on the artist’s personal memories and past lives. By projecting it on the ceiling and inviting audience members to lie next to her to view it, the artist wanted to explore the relationship between the private and the public. Another notable group performance show was About Time, curated by Hajra Haider Karrar for the NAPA International Theatre and Music Festival in March 2016. Unlike Amin Gulgee’s curatorial endeavours, which took place in a gallery setting, this exhibition was presented upon a stage. Featuring Zeerak Ahmed, Yaminay Chaudhri, Shalalae Jamil, Seher Naveed, Fazal Rizvi and Omer Wasim, the 70-minute show unfolded in a temporal sequence rather than being presented as a spatial juxtaposition. “The premise of this project lies in dislocating artists from a gallery to a theatre space where they explore the dimensions of time and collectivity in contrast to space and individuality,” read the curator’s statement. The performances at the show were to be “non-linear narratives” that “interrogate notions of identity, longing, loss, desires and aspirations through personal and social histories mapped in a cultural and political context”. 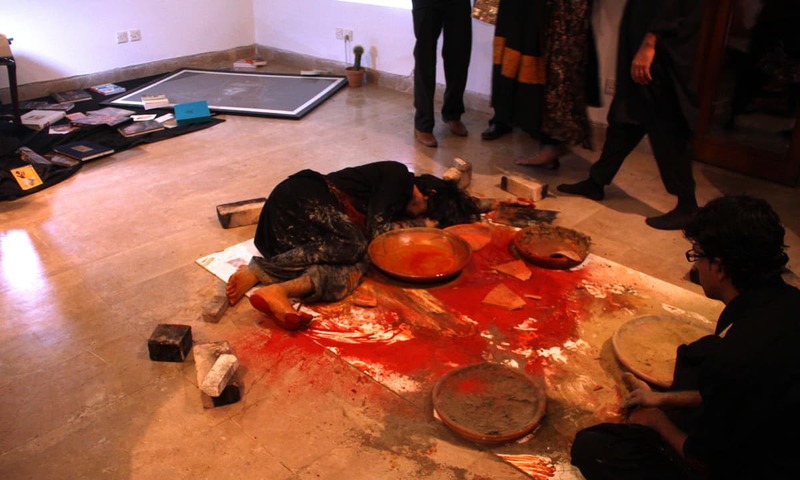 Artist and curator Rabbya Naseer, who has undertaken the unprecedented (and invaluable) task of compiling an archive of performance art in Pakistan, also explored the possibilities inherent in a group presentation of performance art. She curated Promises to Keep, an exhibition that started on June 8 in 2017 and ended on July 29 the same year at Apexart, a non-profit gallery in New York. It featured works by 12 Pakistani women who explored options that women artists in Pakistan have in the representation of their own bodies. The show investigated not just performance art but also the depiction of performance art in photography and video. It featured a re-enactment of Hurmat Ul Ain’s 2011 video work, Great Sacrifice, which shows the artist stitching upon goat testicles. It also included Ayesha Jatoi’s 2006 work Clothesline, consisting of a two-channel, four-minute video showing the artist pulling pieces of cloth dyed in red from a plastic bucket and draping them on the wings of a fighter plane installed on a roundabout in Lahore. Also presented in the show was Meher Javed’s Air Hunger, a 16-minute video made in 2008. It showed the artist breathing through a freshly slaughtered goat’s lungs attached to a tube and a mask strapped to her face as she counted her breaths with a handheld clicking device. 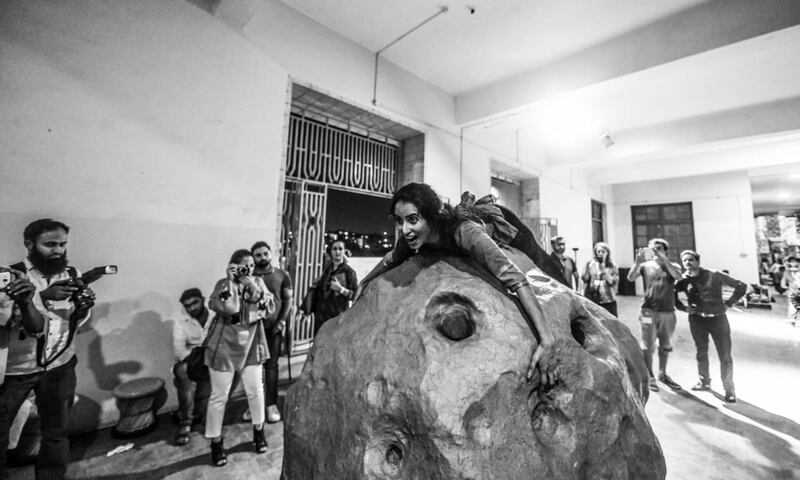 On October 21, 2017, the inaugural Karachi Biennale (KB17) opened at the Narayan Jagannath Vaidya (NJV) High School in the city’s Saddar area. Conceived by its chief curator Amin Gulgee and his team (which included curator-at-large Zarmeene Shah, assistant curators Zeerak Ahmed, Sara Pagganwala and Humayun Memon, and another curatorial team member Adam-Fahy Majeed, the biennale presented the works of 182 artists from five continents in 12 locations across Karachi. It opened with performance works by 17 artists from all over Pakistan who had responded to an open call for participation by the curatorial team. These performances were anchored by the presence at the NJV school of works by two icons of performance art: Yoko Ono and ORLAN. Yoko Ono’s work was a 2004 video, titled ONOCHORD, that showed her instructing viewers to pick up flashlights placed in front of her projection and signal a simple message – I love you – in a Morse code of her own invention. 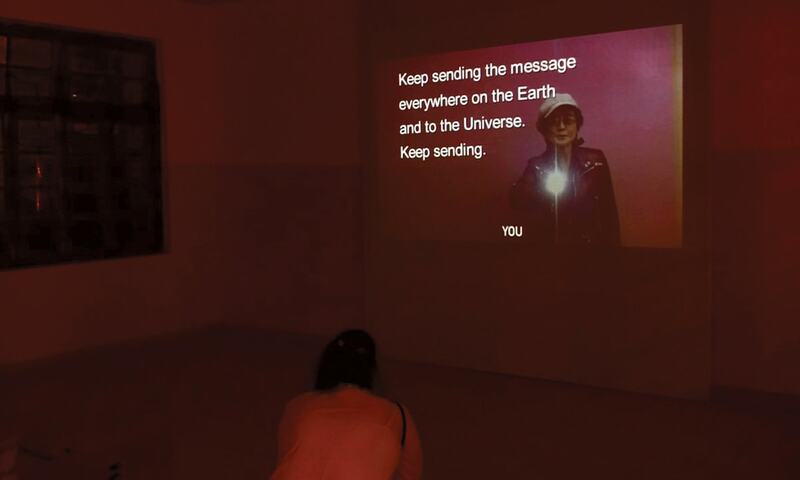 “Keep sending the message/until the end of the year/and beyond/keep sending the message/everywhere on the earth/and to the universe/keep sending,” she could be heard saying. ORLAN’s work consisted of photographs from her hybridisation series in which she had added pre-Columbian and African features to her own face. The series referenced ORLAN’s body art of the 1990s in which she had used plastic surgery on her own body. Other works at the opening of the biennale were equally stunning. In one of them, Muhmmad Ali sat in the room where ORLAN’s photographs were displayed and brushed his teeth continuously for three hours. By the end of the evening, his white kurta was covered with bloody saliva. In Kanwal Tariq’s work, Any Last Words, several performers tied inside black garbage bags lay in a heap in a corridor, twitching within. Batool Zehra painstakingly created an ornate carpet in ash. She then lay down upon it, as if to sleep, destroying its delicate arabesques with the movements of her body. Talal Faisal lay in a pair of shorts, repeatedly stamping himself with the word “invalid”. Not far from him, Zayed Malik held his head in a toilet in a work titled We’re All in this Together. And on yet another day during the biennale, another British artist, Amy Kingsmill, stood in the gallery of Alliance Française de Karachi, a French cultural centre, and bled over a bouquet of white roses. The performance, excruciating to watch, took 20 minutes to complete. By the end of it, the roses were coloured a vibrant red by her blood. Mix Tape 1 curated by Sara Pagganwala at Canvas Gallery in Karachi in September this year was yet another example of a group exhibition of performance art. Pagganwala has worked extensively with performance art, both as an artist and a curator. She has also taught a course on performance art at the Indus Valley School of Art and Architecture (IVS) in Karachi. For this exhibition, 26 performance artists, including Sheema Kermani, Nida Ramzan, Sarah Ahmed Mumtaz, Noor Ahmed, Maha Minhaj and Zoya Alina Currimbhoy, performed works simultaneously over the course of a single evening. What set this show apart was that it took place at a major commercial gallery. “This is not the first time we have presented performance art,” Sameera Raja, who runs Canvas Gallery, told me recently. “We exhibited Amin Gulgee’s [Abacus in 2005] and we have included performance in off-site shows [at places such as] Mohatta Palace and Frere Hall,” she said. Amin Gulgee echoes her views. There seems to be interest and excitement about performance art among the art audience in Karachi, he said to me in a recent conversation. Both Sameera and Amin Gulgee concur that the aim of staging exhibitions of performance art is not necessarily to elicit a positive response. Their point is to generate some kind of reaction. “We keep on doing [it to make] people aware of performance art, to make it more mainstream,” said the former. For Zarmeene Shah, who heads the liberal arts programme at the IVS, such audience reaction is not entirely unexpected. “Performance has not evolved here as it did in the West. You cannot discount street theatre and dance and our own narrative traditions when considering performance art in our context.” The presence of these traditions, she argued, is the reason why we see performance art as somewhere in between the performing arts and storytelling. And it is not just the wider Pakistani audience that is finding it difficult to grapple with performance art. Critics are also struggling to come to terms with it. So even while it is gaining ground, performance art is still an emerging field in Pakistan. It is engaging an increasing number of artists but, for most of them, it is an extension of their other formal practices. They see it as a way to say things they cannot in other mediums. “Performance art’s advantage is that it is ephemeral. You can tackle challenging issues through it,” is how Amin Gulgee put it. The writer is a freelance writer based in Karachi. Many performance artists, writers, painters, singers died during Bangladesh Liberation Struggle.